ic = findInitialConditions(ics,RegionType,RegionID) returns the active initial condition assignment ic for the initial conditions in the specified region. 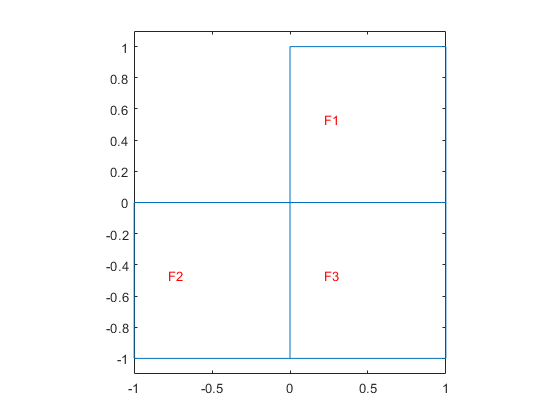 This example shows find the active initial conditions for a region. Create a PDE model that has a few subdomains. Set initial conditions on each pair of regions. Check the initial conditions specification for region 1. Model initial conditions, specified as the InitialConditions property of a PDE model. Initial conditions can be complex numbers. Geometric region type, specified as 'Edge' for a 2-D model, 'Face' for a 2-D model or 3-D model, or 'Cell' for a 3-D model. Region ID, specified as a vector of positive integers. View the subdomain labels for a 2-D model using pdegplot(model,'FaceLabels','on'). Currently, there are no subdomains for 3-D models, so the only acceptable value for a 3-D model is 1. Initial condition assignment, returned as a GeometricInitialConditions Properties or NodalInitialConditions Properties object.